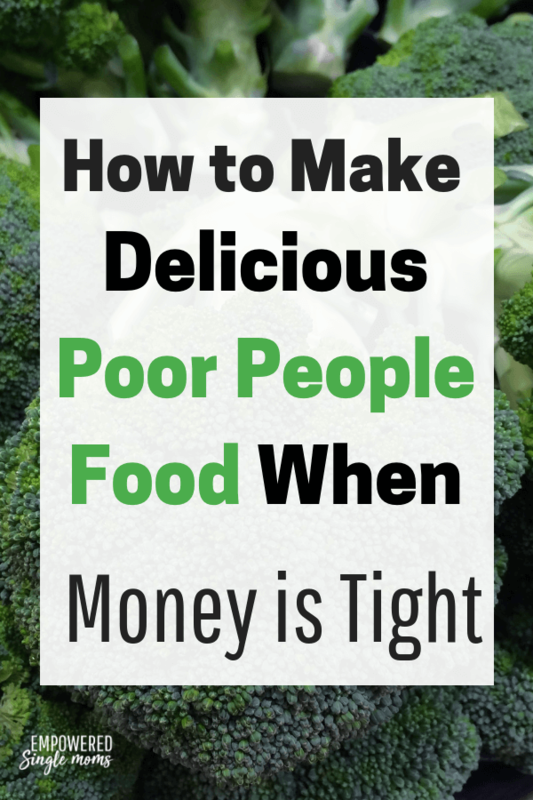 Inside: How to make a cheap grocery list, get free food and eat well when you are poor. 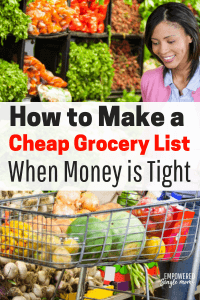 When money is tight this healthy, budget grocery list will ease your anxiety about not having money for food. I was talking to a mom the other day. She didn’t have any food at home to feed her child. She was relieved that her parents were going to loan her money, but she was already anxious about what she would do for food in a couple of weeks. This is a scary and difficult situation, but there are options for free food and several foods that are great to put on a cheap grocery list that will make delicious, healthy, cheap meals. There are places to get food where you don’t have to pay for it. I know it can be hard, but sometimes you just need to swallow your pride and do what you have to do. In the United States apply for food assistance including, food stamps, free lunch and free breakfast for your kids at school. Most communities have shelves or food pantries where you can get free food. What kind of food and how often you can go varies widely from community to community. Many towns have free community meals open to all regardless of income. Some of them even have extra food like bread or brown bananas they will send with you for a snack the next day. If you are not aware of what is available local churches or social service agencies are often good places to find our where to get free food. Our local community has a program called Ruby’s pantry where there are no income guidelines. For a $20 donation, you get two large laundry baskets of food. This is available in many Minnesota communities. Ask at a local church or county social services to see what is available in your community. If you can have a garden where you live plant one. Seeds and sets are cheaper than produce. If you don’t have a garden or even if you do let your gardening friends know you would love there extra produce. Gardeners usually have extra produce and are glad to share. How do you plan a meal on a tight budget? Here are some ideas to get you started planning your meals around food that is typically a good buy. What food to buy when you are broke? These foods are usually the cheapest foods to buy. What are the cheapest foods to buy? Typically these foods are good buys all year round. Get your free printable master grocery list and meal planning sheet here. I already have the cheap ingredients below entered on the list for you and have a space to plan your meals for the week. Having both on the same sheet will make it easier to remember everything in one trip to the grocery store. Potatoes are healthy, filling and versatile. You can add potatoes to your meal and fix them a different way every day of the week. Oven fries go great with sandwiches or eggs of any kind. Baked potatoes are great as a side dish or as a main dish if you stuff them with cheese & broccoli or chili and cheese or cheese and a little bacon if you find bacon on sale. Scalloped potatoes seem fancy as a side dish or add a little ham and you have a main dish. Potatoes can make the basis of a filling casserole. Fried potatoes are yummy as a side dish or make potato pancakes. Potatoes soup is filling and you can make it very basic with potatoes, broth, milk and seasoning or dress it up with a little cheese and bacon. Both add good flavor in stir-fry, soup, fried rice, and casseroles. Celery is great raw with hummus or peanut butter. Get a whole head of cabbage not the bags of coleslaw you don’t need to pay someone to cut it up for you. Get a good chef’s knife and you are good to go. I’ve had one like this for decades. That and a cheap pairing knife I got from the hardware store are the only knives I need. Cabbage is a good source of vitamin C and fiber. I often put it in my potato soup. unstuffed cabbage roll soup is another delicious soup. Coleslaw is one of my favorite salads and it goes with everything. I often have coleslaw for a side at dinner and add tuna or chicken to it for lunch the next day. You can cut cabbage in slabs and roast it in the oven with a little salt and pepper. Eggs aren’t just for breakfast. You can have fried egg sandwiches, creamed boiled eggs on toast or french toast for lunch and dinner too. Frittatas are one of my favorite ways to eat eggs. I like peppers, mushrooms, and spinach or broccoli best. Almost anything goes in frittatas, whatever is on sale or in your garden or friend’s garden will probably work. Drink a glass as a beverage and it provides a lot of the protein you need. It is great in smoothies for breakfast or to fill out a light lunch or budget dinner. Milk is delicious in a cream soup. Milk, flour, and sugar are the basis for pudding, which is a great tasting frugal dessert. Don’t bother with the box just make it from scratch. You can also make your own yogurt with milk and some starter. Buy the dry kind in a bag, cook up a bunch at once and freeze them this is a much cheaper grocery list option than buying canned beans. Again no sense paying someone to soak beans and boil water when you can do it yourself in a pan or Instapot. Baked beans and brown bread is a classic meal. Pulse cooked beans in a food processor or Ninja blender to make delicious “refried” beans in a minute. Beans and rice is a traditional poor person’s meal add some cheese and salsa for flavor or add lettuce & tomatoes for a burrito bowl, sauteed bell peppers are good if you have them. With garbanzo beans, you can make your own hummus, roast garbanzo beans for a snack or add them to a soup. Use several varieties of beans to make a colorful and interesting 7 bean soup. Rice is a classic budget food. Serve it with stir-fry, curried vegetables, meat or lentils. Add rice to soup like stuffed pepper soup. Rice and raisins is a classic depression era dessert. Healthy, hot, filling breakfast or have it for lunch, dinner or evening snack if you are too tired to cook. These are often 4 of the cheapest vegetables. You can use them in stir-fry, soup, salad or eat them raw with a little ranch dressing or hummus. Roast vegetables are another great way to eat any vegetable and leftover roast vegetables are an interesting addition to a salad or add them to quinoa with a vinegarette dressing for lunch. Lentils are a legume, they are a lot like beans, but not quite. Lentil soup is delicious and quick to make. Lentils don’t need to be soaked like beans before cooking, just a quick rinse. You can also add lentils to rice, put some stir-fry vegetables on top and you have a complete meal. Dahl is a classic Indian dish with many variations. Great for breakfast, sandwiches, peanut Thia sauce over pasta, stir fry or salad. Peanut butter banana smoothies are a favorite breakfast of mine. Use it to thicken a soup or make gravy. Pancakes make a filling meal. I like pumpkin pancakes and it makes me feel virtuous to get vegetables with my pancakes. Try them with sauteed apples. It tastes amazing even if it is poor people food. Making homemade bread is a good skill to have and makes the house smell delicious. It always makes me think of my mother when I smell bread baking. She raised 6 kids and bought flour in 25-pound bags. The variations are almost endless, but soup is probably one of the most economical options. You can make lemon, chicken, rice soup, chicken noodle, chicken dumpling or chicken tortilla soup. Try making your own broth with the leftover carcass from a roast chicken or turkey. Creamed turkey or chicken over toast with vegetables in a quick, filling and delicious meal. Tuna casserole, tuna sandwiches, tuna melts or in lettuce or coleslaw salad. Bananas are great for an after school snack or to go with a salad or soup for lunch. Roll them in peanut butter and a little cereal or chocolate chips and you have a messy, but a fun snack. 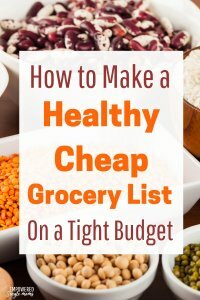 If you want more ideas on how to have a cheap grocery list you will find them in Dining On a Dime Cookbook. What is your favorite budget meal planning cookbook? 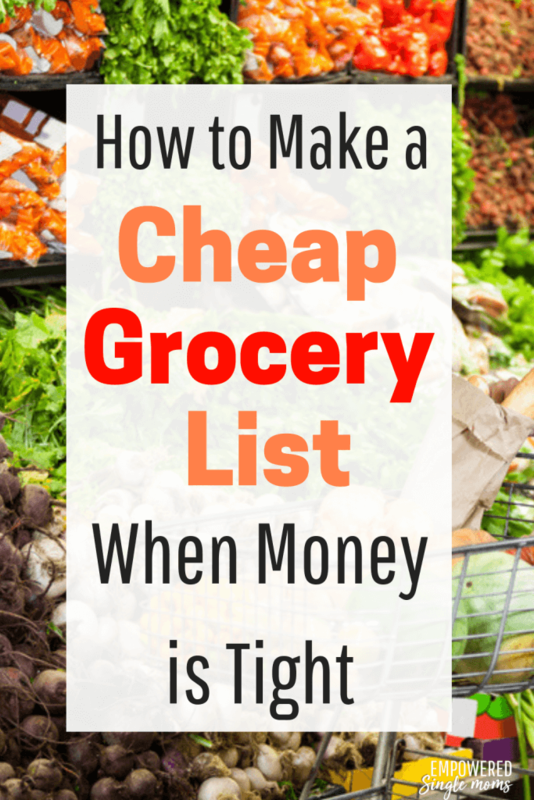 What are your favorite foods to put on a cheap grocery list?